Did you catch Borgy’s exclusive tyre guide yesterday? Today, he brings you his top four tyre tips. Originally, ply ratings referred to the number of cotton layers used to strengthen a tyre’s casing, which in turn indicated the tyre’s load carrying capacity. These days, steel and radial construction (shown) has pretty much replaced cotton so although a tyre might indicate a ply rating like, say, ‘10 Ply’, it doesn’t necessarily mean it’s constructed of 10 individual layers of cotton. It should, however, offer the equivalent in strength. Accelerate smoothly. That goes for steering and braking as well to help avoid a sudden loss of traction. If your wheels start to spin, ease off the accelerator a little to let the tyres slow down and regain traction. Remember, when you lose traction, you are simply digging down! Stick to the ruts where possible; the idea being that the sand has already been compressed to a more solid surface which helps reduce drag. It’s important to remember that load, speed and tyre pressures are all interrelated. If you reduce your tyre pressures while maintaining your vehicle’s load, you must also reduce your speed to avoid excess heat build-up in your tyre. Remember, air is what carries your vehicle and not the tyre. Not having enough air pressure in your tyre will cause a build up of excess heat, which ultimately results in a tyre failure one way or another. So it’s crucial to have sufficient air pressures in your tyres. 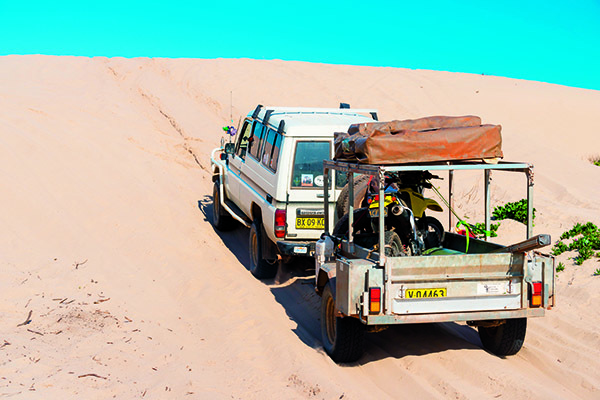 In saying that, reducing your tyre pressures for offroad conditions can be extremely beneficial. It can help broaden your tyre’s footprint or contact patch to increase the available traction, and help prevent punctures by allowing the tyre to deflect over sharp objects. Plus, it’ll help cushion the ride over harsh corrugations too. If you’re not sure what tyre pressures to run, it’s a good idea to drop down to about 30psi first up. Then drop around 5psi at a time until you reach optimal traction. If you feel the tyres get hot to touch, the pressures are too low for the conditions you’re driving. You can see in the image above I’ve marked exactly where the tyre touches the ground when there’s 35psi in the tyre, then again when there is only 18psi in them. Notice the contact area increases in length by a good 2-3 inches overall? It also increases in width, too. While 2-3in doesn’t seem like much, when you’re out on the tracks, it’s a massive gain across all four tyres. 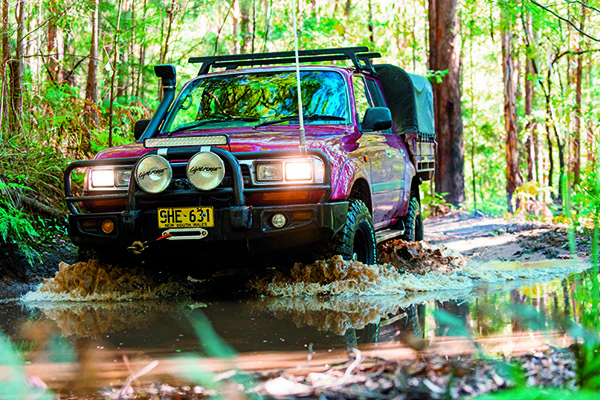 A good 4WD tyre should have self-cleaning abilities built into the tyre’s tread design to prevent it from clogging up with mud and becoming about as effective as a race slick in wet weather. Believe it or not, one of the best ways to activate this is to spin the tyres quickly but in short intervals when required. The idea is that the centrifugal force does all the work for you!